You’re getting married, but before you get to “I do” you need one more weekend of debauchery. Sate all your bachelor party desires in Niagara Falls, where a pack of dudes has complete freedom to fully enjoy the last moments of bachelorhood. Check out what the city has to offer, and plan your Niagara trip like it’s the last night of your life. Seneca Hickory Stick. Because of the presence of the rare Seneca hickory tree, this course more than any other integrates elements of the natural landscape, including native plants and ancient trees. Well-groomed and pleasing, though quite a challenge to any player, this course is simply the best in the region. Thundering Waters. Adjacent to the Falls, you can hear the roar of rushing water throughout your game. However, don’t let the serene atmosphere trick you — this course is the toughest in the region, filled with sand traps, thick woods, and rolling greens. Legends on the Niagara. If you’re more interested in variety and community than landscaping, this is the place for you. Comprised of three different courses (Battlefield, Usher’s Creek, and Chippewa) this complex has excellent bar and restaurant facilities to refresh you after a few hours’ play. Much of what you’re looking for during your bachelor party is good, old-fashioned fun, which is why the arcade is such a draw. The Great Canadian Midway at Clifton Hill has all the games you’ve missed from your childhood — Skee-ball, Whack-a-Mole, etc. — complete with blinking lights and chiming bells. You can make the arcade more interesting with a challenge to collect the most tickets; the loser must buy dinner or drinks for the rest of the night. Casinos are more than gaming tables and slot machines — but that doesn’t mean you have to waste time watching shows and shopping. Fallsview Casino is massive, bigger than three football fields combined, and contains more tables and slots than even we can count. 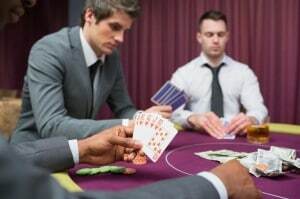 If the floor is too busy or you can’t find your lucky game, head to the Poker Room with tables devoted to Texas Hold ‘Em or Omaha. Alternatively, if you like the exclusive feel of high-limit games, reserve a place in the Salon Prive. Then, if all else fails, the forest of slots should keep you busy for hours on end. To round out the weekend, pay a few visits to the world-class vineyards, distilleries, and breweries around Niagara Falls. The nearby town of Niagara-on-the-Lake is dotted with wineries that offer free tastings and inexpensive meal pairings. There are also plenty of micro-breweries in Niagara Falls where you can find excellent pub food to match the ales and lagers. However, when whiskey is warranted, you can’t find better Canadian flavors than at Forty Creek Whisky and Dillon’s Small Batch Distillery. Niagara Falls is more than a family and honeymoon destination; in fact, there is plenty for a footloose group of dudes to do. You certainly won’t regret a bachelor party spent in Niagara Falls.